How can we help a blind 11-year-old enjoy break time in the playground? In October 2017 I worked with Ruby Steel and Jude Pullen on Season 2 of Big Life Fix, a TV show on BBC 2 where designers and engineers help people with disabilities. Jude and Ruby were working with Josh, a blind boy in primary school who was afraid to play outside. 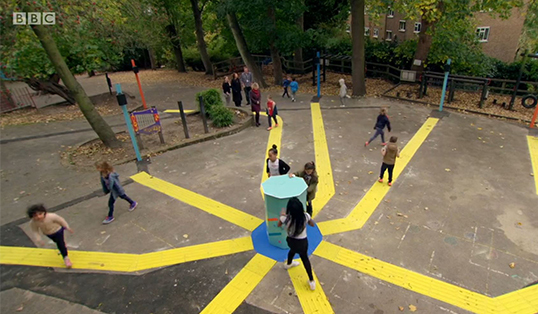 The idea was to build an interactive playground, where you could trigger noises by stepping on pressure-sensitive pads. Tiles in specific locations trigger specific sounds, so Josh can know where he is and can play with the installation on equal footing with his classmates. The idea was not to specify a particular game or rules - we were designing a space for play. There were even a few secret 'easter eggs' in there - special sounds are triggered when you stand on certain tiles simultaneously - which adds a sense of surprise and delight. Time was short, so the prototyping was focused. The installation had to either work perfectly first time, or else be easy to diagnose and fix. After helping Jude with the electronics design, I wrote the code to tie it all together and work. We then had a busy weekend of wiring and installation - and, yes, debugging - to get everything ready in time for filming. This was a first-in-kind installation and it has been a great success overall. It is currently in daily use at the school and Josh gives it two thumbs up.